Easily the #1 mistake that tech companies make when promoting Webinars is that they forget that they’re selling an event. In order for a prospect or customer to register for your event, it’s critical that your email invitation convince him/her that the benefits of attending the Webinar make the investment in time worthwhile. Unfortunately, many tech marketers use Webinar invitations as simply a vehicle to preach the virtues of their product, whilst the actual offer (the Webinar) is an afterthought. 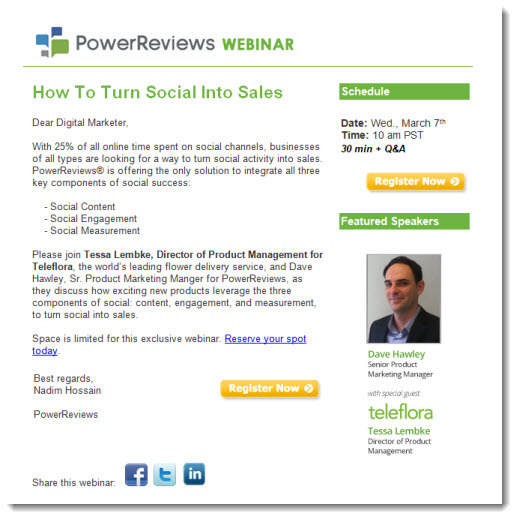 As an illustration of this approach, consider the email invitation below that I received recently from the marketing team at PowerReviews, a company that bills itself as “the world’s largest social commerce network.” The overall structure of the invitation has its good points: there’s minimal use of graphics, the call to action (“register now”) appears multiple times throughout the copy in both text and button form, and the sidebar includes a photo of the speaker, which is an effective way to make the event seem more “real” and thus drive response. There’s only one thing missing: namely, why exactly should I attend? Rather than provide concrete examples of what I’ll learn, discover, see or hear during the Webinar, the copy extols the PowerReview solution, for which the Webinar is simply a backdrop. Now that may be fascinating to some, but 1) it lacks any kind of action-oriented language (e.g. “learn how …”, “discover why …”) and more painfully, 2) there’s absolutely no mention of the Webinar and why I should attend. In the next paragraph, more than halfway through the copy, I’m finally invited to the event (“Please join …”) but the reasons for my doing so are relegated to learning “how exciting new products leverage the three social components of social …” In other words, I’m being invited to a sales pitch. Now, let’s face it: it’s understood by all but the most naïve reader that any Webinar invitation is designed to introduce someone to a company’s product or solution. But that doesn’t mean you have to be quite so transparent about it. Instead, sell the event so that it will appeal even to someone who has no immediate plans to engage with your company. What will he/she learn during the event that would make that investment worthwhile? What information, insight, or analysis will he/she gain by attending? * why are those three components so important to social selling? * what is it about having all three that would make a social initiative successful? * what are some real-life examples of initiatives that have been successful in using this approach? all of which would make me seriously consider the invitation. But just to hear a senior product manager tell me why his product is so exciting? This entry was posted in B2B Marketing, Campaign Strategy, Demand Generation, email design, email marketing, Event Promotion, Webinar Invitations, Webinars and tagged email design, email marketing, PowerReviews, Webinar best practices, webinar campaigns, Webinar Invitations, webinar marketing, webinar strategy on March 20, 2012 by Howard Sewell.